Ive used this model for years and it never lets me down. These tire really lived up to their description. I raced on them for the first time yesterday on a course that was very muddy with lots of slippery off-camber slopes. Riders all around me were sliding out, creeping along as if terrified they would slide out, but I was plowing through with hardly any issues at all. These tires gave great traction on the muddy slopes, and without compromising on speed on the few solid parts of the course. I'm ordering another set for my daughter. 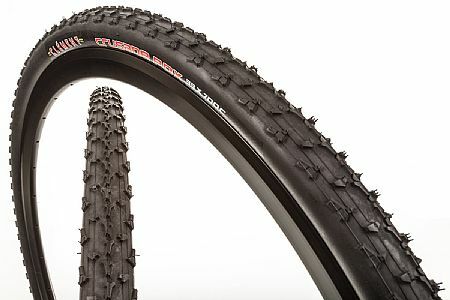 Fantastic Clinchers - Live up to the Crusade PDX name! This is my second year racing Cyclocross and I decided to buy a new pair of clinchers for my Jake the Snake. I've run these tires for 8 races this year in Oregon (Cs and Bs), from the wettest, sloppiest conditions at Blind Date at the Dairy to hard packed mud and sand at Cross Crusade and GPET, these tires have outperformed my expectation (and skill set) every time. Such amazing traction, they give me the confidence to push myself faster and faster around tight corners and off-cambers and it seems the more I push, the better they respond - especially in the sloppy stuff. I weigh around 160lbs, and started the season running these at around 40psi up front and 42psi at the back, but have now gone down to 30psi front and 32psi in the back. No flats or rolls so far (except for a goatshead thorn in the tube), and the tread still looks deep and like-new. I absolutely love these tires. Tested this tire at a worthy course two times in the last week. Conditions wet, muddy, greasy, grassy, bark dust, gravel. Provided traction for turning, descending and ascending. Great when its dry and in the mud. I havent looked back. Already had one puncture that sealed up nicely... thank you tubeless! I had set these up front and back to try and get as much traction during the dry PNW summer. Not a great idea. On the rear, this wears super quickly if youre riding any tarmac between off-road sections. Also, it didnt hook up on ourloose-over-hard rock and gravel. Instead, I switched to an MDX on the rear (run in reverse to scoop and bite), and this worked great. Just rode yesterday on a wet, rooty and rocky XC trail, and this stuck like glue. First race this last weekend running the tubeless versions of the PDX and I'm very impressed. Conditions were terrible, temps in the low 30's and long stretches of deep mucky mud, including uphill and down. Snow and ice as well, loose wet gravel, slick grass, which meant perfect 'cross racing conditions! I could really feel the difference of these tires over my previous 32mm Grifo Challenge tubed tires that came with my bike. Very grippy everywhere in the mud, grass, wet, ice, snow. I ran them 25 psi front, 27 psi rear, and I'm 193 lbs and I had no problems at all, didn't feel like I was rolling on the rim, even through some rocky sections, I'd go in thinking I'd have to pick a perfect line, then remembered I'm running tubeless so no worries of pinch flats! Overall I can tell these are going to be one great set of tires for racing in classic PNW 'cross conditions. I'd highly recommend them if your into mud. Any muddy cyclocross race in the Pacific Northwest will have plenty of people running these clinchers, and for good reason. They drive through mud without getting caked up, they stick to the ground in corners, and they even roll efficiently over asphalt and dry ground. CX racing and training. Great tire. No dislikes. Excellent all around CX tire. My favorite cross tire of all time. Light, rolls fast. Knobs are the right height-not so tall they roll over and lose grip like some others. Great all around-no complaints dry or wet (!). Here in the Pacific Northwest you're likely to see more PDX's on the start line of a 'cross race than any other tire. I'd heard nothing but good things said about them so I decided to give them a go for the 2014-2015 season. I've been running them in a variety of conditions at 40ish psi. with latex tubes and have found the traction and ride quality to be better than any other tire I've ridden. I'd definitely buy again. Also, as an added bonus, they mount up super easy - I haven't even needed to use tire levers. The only thing to be aware of is that the rubber compound feels really soft. I'm sure this is probably why the traction is so good and the ride is so supple, but if you spend a lot of time on asphalt I'd go with another tire. These came in at 35.4 for the 33mm size. Sadly they wouldn't fit in my frame on the rear. I plan to use on the front (or get a frame with greater clearance) soon. For the weenies out there, my scale shows these tires at 280 grams. This really is a great all around tire. It begs for mud and slime but hooks up just as well on hardpack and grass. Very supple tire so I found I had to run a little more pressure in them than I would my other tires but it didn't have any effect on traction. I put these on prior to a muddy cross race with a lot of grass that was churned into mud. Had great traction all day, and could ride sections others could not. The best cross tire I've tried to date. Great tires for muddy conditions. This grippy tire is great for Portland's muddy and wet conditions. The tire has been durable through the season and has been great through the Cross Crusade. Sold as a mud condition tire but it works great in wet and soggy grass conditions. These tires mounted up really nicely. They feel like a larger volume than a 700x33 and really grip in all conditions.